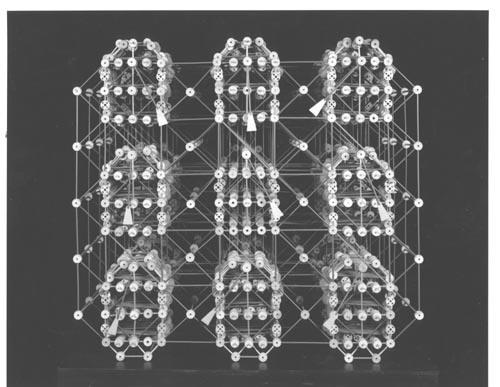 Black and white image of Tinkertoy computer made by Danny Hillis and Brian Sillverman. Even sticks and pulleys can be used to compute. The rules require to play tic tac toe are here built into 10,000 wooden parts, fishing lines and sinkers and brass pins. The wooden parts were taken from some 500 boxes of Tinker Toys. The nine green flags on the front of the machine show the current positions: Down: empty Left : X right : O The human player moves one flag to make his move. Then mechanical linkages cause the machine to respond instantly with its reply. The machine never loses, but plalyed unreliably in practice because the fishing line tended to loosen and slip. Verso: Paper sticker: "Please return to: The Computer Museum Photographic Archives 300 Congress Street Museum Warf Boston, MA 02210"
Paper sticker: " Photo courtesy of: The Computer Museum History Center 650-604-2575"